HILLSBOROUGH, NJ – The skies over Hillsborough’s Central Jersey Regional Airport will be filled with a rare showing of military and vintage fixed-wing aircraft and helicopters on Saturday, Oct. 8, as part of a day-long event to help Rotary District 7510 raise funds for various charities and foundations dedicated to assisting active US military and veterans. Pilots from dozens of airports throughout New Jersey have been invited to participate with their planes. The event will be held from 1-5 p.m. Admission is free. eterans and active military and the general public are invited to attend. There will be food vendors, live music, military equipment, a static airplane display, face painting, fire engines and other activities for children. 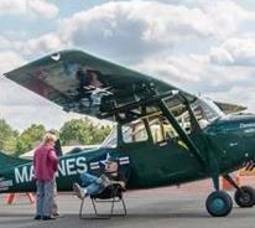 A key fundraiser and favorite from last year’s event – plane rides by the flight school, TriState Aviation – returns this year. Proceeds from the event will be used to fund New Jersey organizations that work to benefit former and active members of the US military. Donations of food, clothing and toiletries for the military and veterans will be collected at the event. Participating organizations include Operation Shoebox New Jersey and Operation ChillOut. Outreach and information for members of the military and veterans, as well as their families, will be provided by several organizations, including the Veterans Administration (VA) and Welcome Home Vets of New Jersey. Veterans who need assistance with obtaining benefits or help from the VA are encouraged to come to speak with these representatives to learn about the valuable resources they provide. Operation ShoeBox, Operation ChillOut and Welcome Home Vets of New Jersey will host displays at the event where donated items can be dropped off. Operation Shoebox New Jersey will have a display of greeting cards for children to color. The greetings will be included in the care packages shipped overseas. Welcome Home Vets of New Jersey will have representatives on hand to assist vets with any personal and/or financial difficulties they are having. The rain date for Military and Veterans Appreciation Day is Sunday, Oct. 9. Entrance to the airport is located at 1034 Millstone River Road. Veterans Appreciation Day is sponsored by several Rotary clubs from Rotary District 7510; which comprises 39 Rotary Clubs with a total of over 1,000 members from Central New Jersey and Pennsylvania. Participating in this event are the following clubs: Branchburg, Bound Brook – Bridgewater, Dunellen-Greenbrook, Hillsborough, Lambertville – New Hope, Montgomery – Rocky Hill, Piscataway, Plainsboro – North and South Brunswick, Somerville and Bridgewater. The Hillsborough NJ Rotary Club currently has over 40 active members from Hillsborough and surrounding communities. Members include business and professional leaders who provide humanitarian service, encourage high ethical standards in all vocations, and help build goodwill and peace in the world. The Hillsborough Rotary serves the Hillsborough community. All funds raised at the Rotary Fair and other Rotary events throughout the year are donated back to community projects. The Hillsborough Rotary Club meets every Wednesday at 6 pm at Pheasants Landing Restaurant at 311 Amwell Road in Hillsborough. Operation ChillOut, based in Long Valley, is a grassroots interfaith coalition founded in the year 2000 by concerned volunteers to help a group of homeless Vietnam veterans living in the open under a railroad trestle in northern NJ. They provide emergency supplies and survival gear to the most vulnerable members of our communities wherever they encounter them. Operation ChillOut is seeking new and unused clothing that will be donated to homeless veterans. Requested items include knit cap and gloves, wool/nylon blend socks, insulated underwear and hooded, zipper sweatshirts in sizes large and extra large. Operation Shoebox New Jersey, based in Hillsborough, was founded in February 2005. It is an all-volunteer grass roots organization dedicated to collecting donated supplies and shipping care packages to U.S. troops based in Iraq, Afghanistan and other Middle East countries. Operation Shoebox seeks donations of food and personal care items that are placed in care packages shipped to members of the US military deployed overseas. Requested items include canned tuna, canned fruit, 1 oz. boxes of cereal, dried fruit, trail mix, granola bars, beef jerky, small bags of pretzels and chips, small tubes of toothpaste, toothbrushes, small packets of moist wipes, soap, deodorant, small canisters of powder and small bottles of shampoo. Welcome Home Vets of New Jersey is a non-profit organization specializing in Veteran advocacy and financial assistance. Many vets aren’t aware of all the benefits available to them and if they are, they don’t know how to navigate through the system to obtain them, which can be grueling. Welcome Home Vets of New Jersey provides a wealth of information and support to vets looking for services and/or having difficulty obtaining benefits from the Veteran’s Administration. Their agency is comprised of professional volunteers willing to donate time and resources to support New Jersey Vets. Are you having difficulty paying utility bills? Finding employment? Obtaining benefits or require legal assistance? If so, Welcome Home Vets of New Jersey can help you navigate in the right direction to address your needs.